As the world depends evermore heavily upon the Internet and all the devices connected to it, cybersecurity emerges evermore prominently as an imperative in all industries. The automotive and especially financial spheres present no exception. With sophisticated advances in hacking tactics targeting larger marks, auto and financial businesses must have their cybersecurity in check and kept to state-of-the-art standards. Though it may seem like a more recent development, computers control myriad devices and operations within vehicles and have for decades, from engine timing, emissions systems and cruise control to your seatbelt tensioners and door locks. But connected cars, using Wi-Fi and Bluetooth to interface with your vehicle’s electronic control units (ECUs) and cell networks, present further security concerns requiring due diligence to keep connected systems updated and protected. And while reports of hackers driving cars into ditches may lean towards sensationalism, there remain serious potential issues of privacy, fraud, theft and system failure. The prospects of autonomous vehicles heighten these concerns even further. Tesla’s Autopilot system has resulted in at least two fatalities — one in Hubei, China; the other in Florida — and most recently, Uber’s rollout of self-driving cabs resulted in the widely publicized death of a pedestrian in Arizona. While these tragedies can be partly (if not largely) blamed on operator error, the fatal accidents do beg many questions: Why didn’t the autonomous driving system correct itself against such hazards? How safe, secure and reliable are these systems? How much real-world testing should they undergo, and how do we regulate and safeguard them? Auto finance presents similar questions regarding cybersecurity — namely, how do we safeguard and regulate these new systems while they continue to improve our fiscal efficiency? Data breaches have become headline news especially in the past few years, and companies are becoming more vigilant about their own cybersecurity in the wake of such recent events. Measures like the European Union’s General Data Protection Regulation — known better by its initials, the GDPR — include extensive protections for personal data, and other companies have already taken initiative prior to the GDPR’s impending enforcement later this month. For example, after Equifax suffered their attacks in 2017, they stated at Used Car Week, “We are a different organization, committed to cybersecurity beyond the walls of Equifax,” and declared a commitment to working with government and regulatory bodies to ensure further safety, as well as a change in paradigm from looking at their data as numbers and instead as human beings. Another big issue in cybersecurity: blockchain. Blockchain definitely promises accountability and transparency in many facets of finance. For instance, blockchain could track not just ownership, but also warranty information and other important financial info. But it requires cohesive, wholesale involvement among all players in the financial business — not to mention their clientele! And such an interconnected concept also requires trust and security between all partners and parties. However, as blockchain evolves from cryptic concept to buzzword to household name, more and more sectors and businesses within them will likely adopt this revolutionary idea. These are but a few concerns we all have regarding the continuous evolution of cybersecurity. We will all surely learn more about them as the years roll on, but if you’d like to prime yourself and stay ahead of the game, you should join us at the Raleigh Marriott Crabtree Valley for the inaugural Automotive Intelligence Summit. 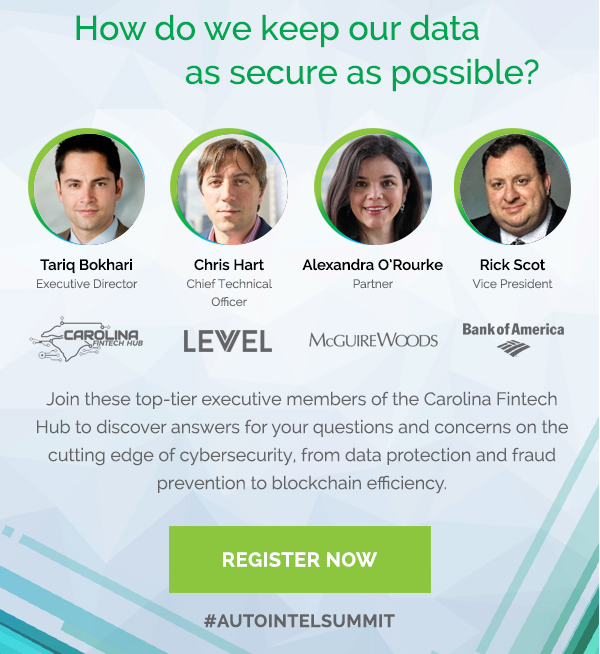 We’ll be hosting a dedicated cybersecurity panel, populated by members of the Carolina Fintech Hub, on Wednesday, July 25 at 2:30 p.m. Levvel Chief Technical Officer Chris Hart; Womble Bond Dickinson, LLP Partner and Fintech Co-Lead Alexandra Villarreal O’Rourke and Bank of America Vice President Rick Scot will sit on the panel, with Carolina Fintech Hub Executive Director Tariq Bokhari moderating.